Valley Irrigation's GPS Guidance and BaseStation2-SM products were recently recognised with AE50 awards from the American Society of Agricultural and Biological Engineers (ASABE). The GPS Guidance and BaseStation2-SM products were put before a panel of expert judges representing all facets of the agricultural, food, biological, and related systems engineering professions, who expect the recognised products to save producers time, costs, and labor, while improving user safety. The annual AE50 program has been recognising engineering achievements for over 20 years with winners coming from companies of all sizes from all parts of the world. “The AE50 is the only award program of its kind, which celebrates companies for developments in specific areas of agricultural, food and biological systems,” says Director of Publications for the ASABE, Donna Hull. “Many of the honored, new ideas that are given awards are patented and their names trademarked. In the future, some may even become household names...others will be further improved as technology advances,' adds Hull. The recognised Valley Irrigation GPS Guidance product is a cost-effective guidance option that eliminates the need for buried wire guidance systems, and is conveniently available on linear machines and corner arms. It can be easily installed and quickly adapted to any changes to the field or crops. This guidance product is compatible with John Deere Starfire RTK technology to accurately steer the machine around the field for the most precise application of water and other crop inputs. Valley Irrigation teamed up with Irrometer to incorporate Watermark sensors on the other recognised product, the BaseStation2-SM software. 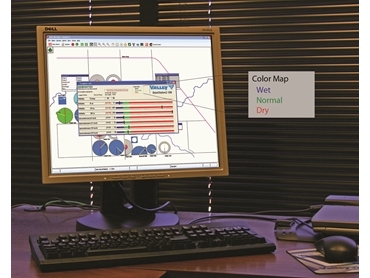 The BaseStation2-SM is a centralized irrigation management system for a grower’s home or office computer. With the BaseStation2-SM irrigation system, reliable, remote irrigation management is combined with the ability to monitor soil moisture status. With this system, growers no longer need to make extra trips to the field to check soil moisture. These AE50 awards are a testament to the continued commitment of Valley Irrigation to develop innovative and technologically advanced products for growers utilising mechanised irrigation equipment. The Valley Irrigation brand is recognized worldwide as the leader in sales, service, quality and innovation, and has been recognized as such since Valmont founded the mechanized irrigation industry in 1954.